This Saturday Tai Chi class taught by Florence St. Peter in Rose Park – please join in at 11am. This class is held every Saturday. It is free/donation class. All are welcomed! Tai Chi Chih is a meditative form of tai chi. Developed by Justin Stone in 1974 is a series of 19 movements and one basic pose dedicated to circulating and balancing the Vital energy (Chi) that flows within all of us. All the movements are slow and gentle, making them accessible to anybody, regardless of age, weight or physical activity. And it is right after Danny’s locally famous puppy training class which is held every Saturday at 10am. Again his class is free and all are welcome. 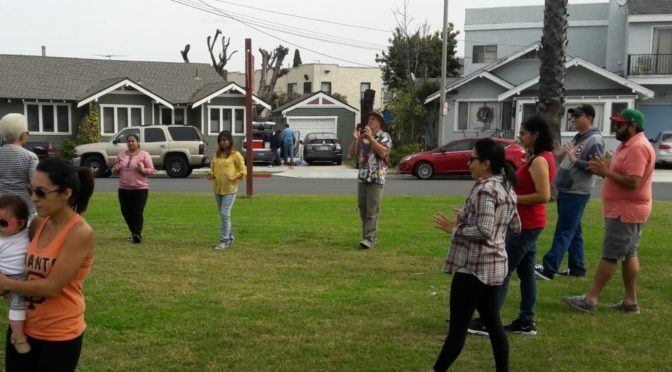 These activities are developed and provided by RP neighborhood residents committed to giving and giving back. It’s a great day in the Park! Photo is Flo giving a demo class at the recent Eggstravaganza.